The Permanente Journal advances knowledge in scientific research, clinical medicine, and innovative health care delivery. 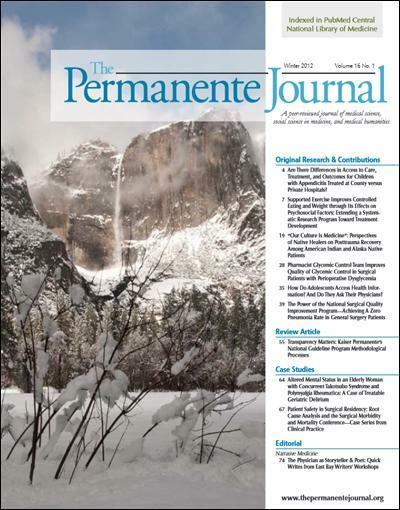 Sponsored by the National Permanente Medical Groups, The Permanente Journal is a peer-reviewed journal of medical science, social science in medicine, and medical humanities published in print quarterly by The Permanente Press. Journal subscriptions are entered for the calendar year. Advance payment in US dollars is required. Please include both old and new addresses. Journal subscriptions are entered for the calendar year. Advance payment in US dollars is required. Listed price includes shipping and handling.